You are currently browsing the category archive for the ‘Canadian history’ category. Last Friday, I found out about the “new” abortion caravan organized by a group called the Canadian Centre for Bio-Ethical Reform (CCBR) traveling the country from Vancouver to Ottawa to push for the re-criminalization of abortion in Canada. I heard about this because I found out it will be stopping in London tomorrow (Monday June 25). Since learning this, I started to read about the original abortion caravan that also traveled from Vancouver to Ottawa in 1970, pressing for the legalization of abortion in our country. This caravan was started by a group called the Vancouver Women’s Caucus (VWC), and traveled across the country making many stops as they went, holding public meetings and listening to concerns they would aim to address in Ottawa. The travels of the caravan culminated in the group’s arrival in Ottawa, where several protests were held. These protests weren’t without controversy, as the group carried a black coffin on Parliament Hill, and burned an effigy of then-PM Pierre Trudeau outside of 24 Sussex Drive. “The coffin represented pregnant women who’d died from back-alley procedures or their own horrific attempts with knitting needles or coat hangers” (as told in this story). Just before 3 p.m., one of the women stood up and started giving the group’s speech. As the guards closed in on her, another stood up in another gallery and continued. One guard told The Globe and Mail’s Clyde Sanger that the women were “popping up all over the place.” They shut down the House of Commons, and the Vancouver Sun reported it was the first adjournment provoked by a gallery disturbance in its 103-year history. 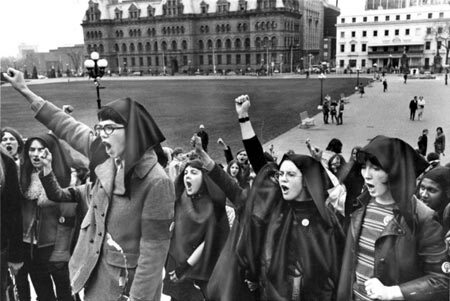 The caravan was also Canada’s first national feminist protest. It laid the path for the decriminalization of abortion in Canada in 1988, and marks an important part of Canadian history. The new caravan aims to parody the original caravan, hijacking its associations and creating new ones. It too is doing a series of speaking engagements across the country, but the vehicles they’re using feature disturbing images of aborted fetuses (as does their website). The CCBR argue that the images force people to think about the issue and sparks conversation, while opponents to the caravan argue the images are being used irresponsibly to evoke emotion and stop people from thinking about the issue sensibly. Tomorrow evening the new abortion caravan will be in London, at 254 Adelaide St S., London Youth for Christ. A group of activists that feel strongly about a woman’s right to safe abortion will be there to form a counter-protest, as has been happening across the country at every stop the CCBR has made. Many people are getting involved. Among those that will be there to speak are Irene Mathyssen, NDP MP for London-Fanshawe and Megan Walker, the Executive Director of London Abused Women’s Centre. For more information, the Facebook page for the event is here. This is a deeply complex and emotional issue. There is a time and a place for open dialogue and debate, but I believe it is irresponsible to use such traumatizing imagery, especially on vehicles where all members of the public will see it whether they wish to or not. As well, for my part, I believe in a woman’s fundamental right to have the option of safe abortion medically available to them. For these reasons, I will be there to observe and take part in the counter-protest. I ask anyone who feels strongly about this issue and is able to be there to please come.